Team Captain - Chris "Red Bull"
The WMR Ringer - Roberto " Motolo"
Way to go San Fernando! 1 . Afflicted with or characteristic of mental derangement. 2. Very foolish, *harebrained ideas*. Id like to compare the above two definitions by illustration. 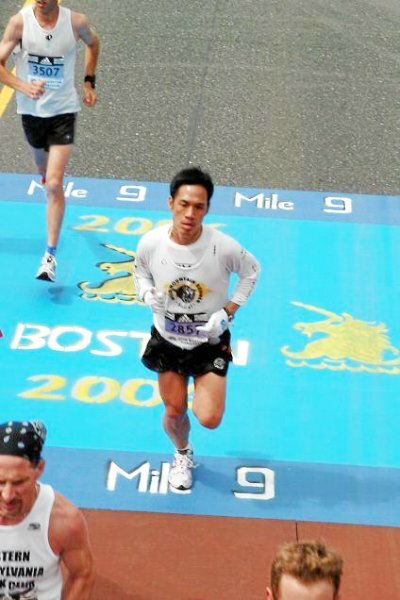 Imagine running April 17th Boston marathon with a fast finishing time of 3:20. 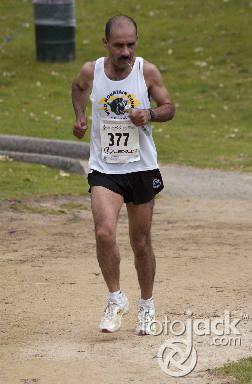 Now you rest for four days then run a Saturday April 22nd 50 miler Ultra Marathon. For most of us the concept of running a marathon and then an ultra marathon back to back seem completely unfeasible and daunting. Not our Barefoot Ted. This unbelievable accomplishment now qualifies Ted for the AC100 this year. A long time goal accomplished! Check out the link below to learn more about his accomplishment. 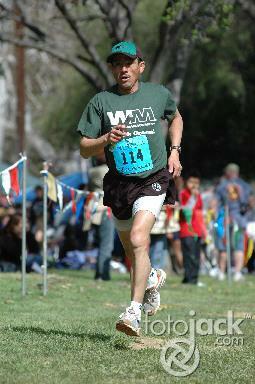 The Wild Mountain Runners entered three teams in the Jimmy Stewart Relay Marathon held April 23, 2006. Although WMR entered few teams in comparison to other years, their performances exceeded all expectations. WMR was represented by a master team a co-ed team, and an open team. The masters division was represented by our one and only Dream Team. Actually the team should be called the Nightmare Team because of the terror they impose on unsuspecting running teams. And on a beautiful and sunny Sunday, terror is exactly what they brought on the competition. Coach Roberto *Kadafi* Perez could not hold back his excitement when he was interviewed for this article. 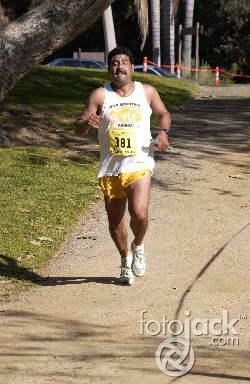 Not being able to run because of an ankle injury, Kadafi provided inspiration and guidance to the Dream Team by running to a fro the course, yelling out encouragement and instructions. 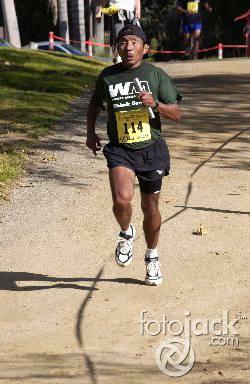 Last year the Dream Team was beaten by a very determined and talented San Fernando WMR masters team. This year San Fernando was listed as Think Green, their sponsor. 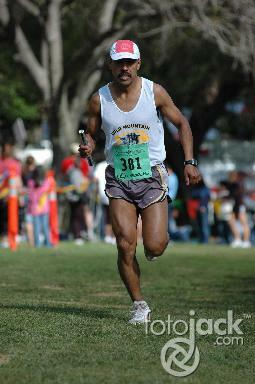 Committed on beating San Fernando, Kadafi put together a talented group of runners. 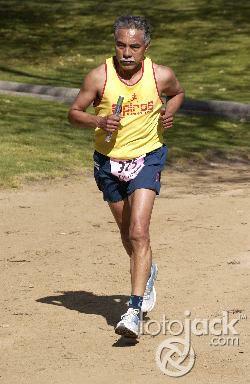 Adalberto *Flaco* Mendoza, age 58 who just competed in a 50 mile ultra, opened with a 32 minute time split. 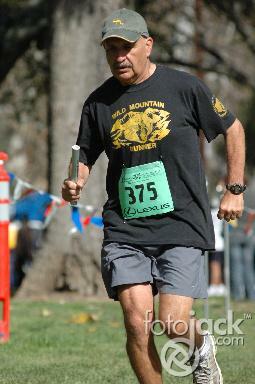 He handed off to Esteban Almada, age 58, who by this time was 1:30 seconds behind San Fernando. Almada gave a gutsy performance by keeping our team in striking distance. 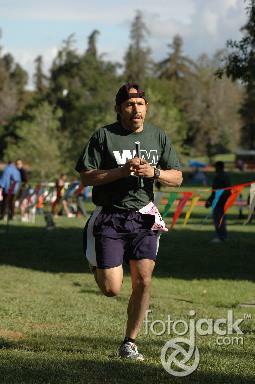 When Bob Macias, age 56, took the baton, he was unaware that San Fernando was ahead until Kadafi yelled out that Ramon *Apache* Cuevas was 1:30 minutes in front. A talented runner in his own right, *Apache* forced Macias, a former sub 14 minute 5K runner, to use all his experience to catch up. *All I could think of was -- catch Apache, catch Apache*. said Macias. 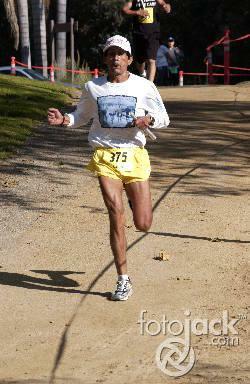 And catch up he did by handing over the baton to Eliseo Garcia, age 51, with a 12 second lead. 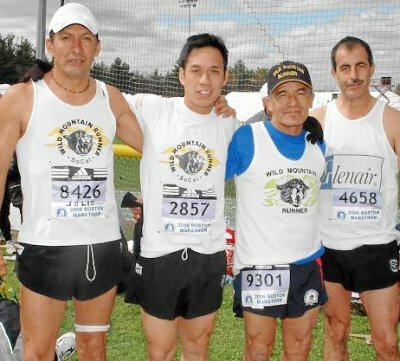 When Eliseo gave the baton to Maurilio, age 60, of South Gate, the race unfolded to a new and exiting level. Maurilio settled into a comfortable pace knowing that he had a 1:30 lead over Think Green. 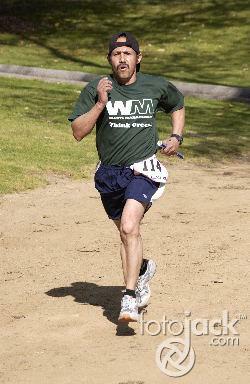 At the one mile mark, his comfortable pace was soon rattled when a runner from TCLA II asked him *How old are you? 60? * responded Maurilio. 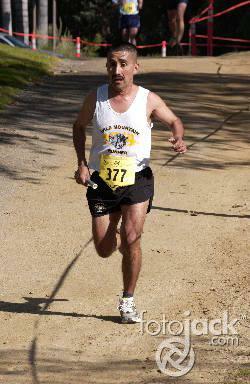 Maurilio then realized that the competition was not San Fernando but the runner next to him. The race went neck to neck until Maurilo and the TCLA II runner where about a 1/3 of a mile away from the finish. Except for Maurilio, everyone from our club was unaware of the struggle between these two master runners. Then Kadafi heard a commotion coming from a group cheering for their TCLA II. Realizing that the first place medal was up for grabs, Kadafi and other Gato members could not find enough air in their lungs yelling encouragement to Maurilio. Like a gladiator reaching for the last ounce of strength, Maurilio fought off the persistent TCLA II runner who kept the pressure on until the finish. Having used up all his strength, Maurilio almost fell to the ground. The official times were: Dream Team 2:52:37, TCLA II 2:52:39 and Think Green 2:54:03. As excited as Kadafi was about the Dream Team, Maggie Fernandez was just as excited when her WMR co-ed team placed first in the Family and Friend Division with a time of 3:13. 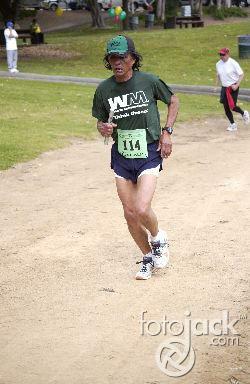 Determined not to be outdone by the all-male WMR teams, Maggie had Victor Carrillo on the first leg. 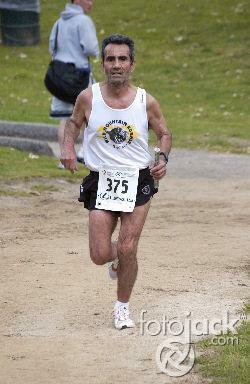 As young as Victor looks, he is one of the clubs veteran members who is best known for his blazing hill running. 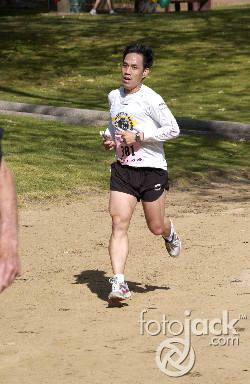 Victor ran a fast leg and then handed of to Rosa Arevalo. 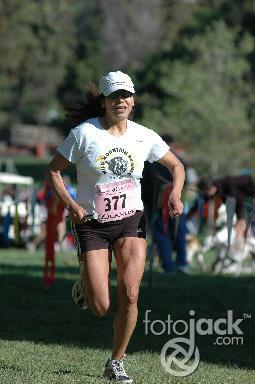 Rosa use to be known for her speed, concentrating more on 5ks and 10ks. 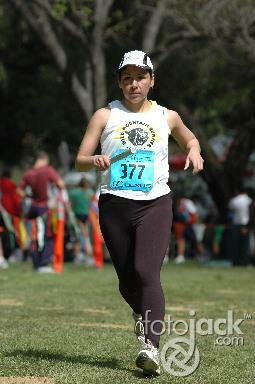 However since she joined the Gatos, Rosa has been transformed into a formidable long distance runner. 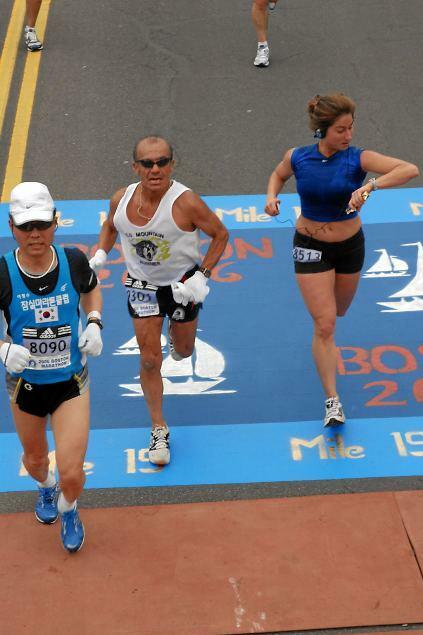 Although Rosa is recovering from a grueling April 17th Boston Marathon, she was still able to combine her speed and endurance and maintained the lead. Rosa then handed off to Dave *El Huero* Matson. Taking advantage of a comfortable lead, Dave kept the team in first place when he handed the baton to team captain, Maggie. Although Maggie is not satisfied with her running time, she never lost the lead. Smiling, she put the baton on Rafa?s hand. 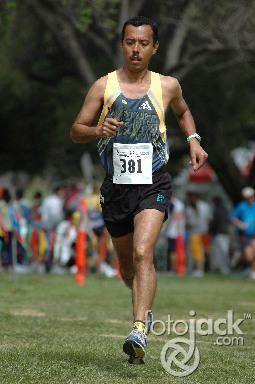 A winner of many races, including the 2006 Santa Clarita � marathon, Rafa suffered a recurring hamstring pull at mile three and had to completely stop running. He was able to recover a little and was able to hobble to the finish, one minute and forty seconds ahead of the second place team. When asked about the team Maggie said *I am proud of the team. Frankly I am not surprised with our first place win considering the talent that we have*. Right on Maggie! Chris Quesada who could have easily placed 1st in the Corporate Men, Entertainment Industry Men , Family/Friends Men, etc. but instead registered his WMR *Team Redeem* in Running Clubs Elite Men. *I wanted to find out where we stood competing with the big boys. This is after all our own backyard*. said Chris. Chris also coming back from Boston last Monday finished his leg in 32:51. WMR -Team Redeem came in 9th place overall with a finishing time of 2:46:58 Team members Roberto *Motolo*, Rodrigo, Javier and Douglas did all excellent, excellent times. Runners get to sign their name on the wall which corresponds to their race numbers with a brief statement why you run. Noticed I put "AQCL". 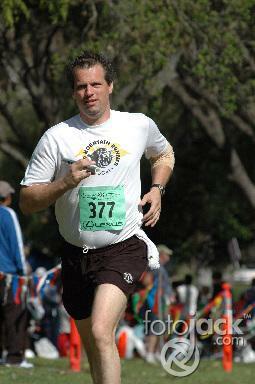 I was running my first Boston in loving memory of my father. Antonio Quesada - Celebration of Life. 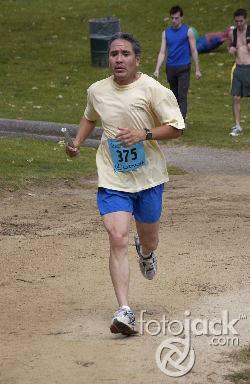 He ran on behalf of Anheuser-Busch Companies, Inc.
"Somewhere in the world someone is training when you are not. 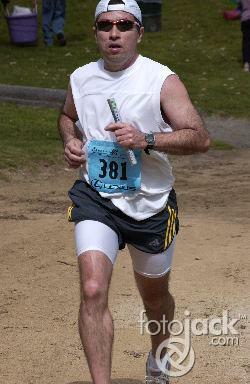 When you race him, he will win"
Hopkinton where 20,000 plus runners wait for the start of the race @ 12:00 noon.